Legal maternity homes, also known as maternity hospitals, were registered with the state and had to follow certain protocol. They required women to provide their full names and other personal information and often requested a sizable fee for admittance. 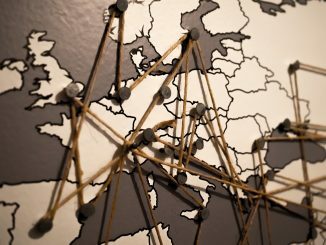 They were usually associated with religious charities and some also operated orphanages nearby. By the mid 1940s, Lutheran, Catholic, and Jewish organizations had formed specifically to assist with placement of abandoned children, but a decade prior, Milwaukee’s foundlings were often sent to overcrowded orphanages. An unwed mother may have chosen an unlicensed hospital not only for discretion, but also in the hope her baby might be expeditiously placed into a loving home. Though Lawrence’s interviews with old neighbors led to rumors of several illegal maternity homes, I was able to find evidence of only one operated by Dr. Trump. 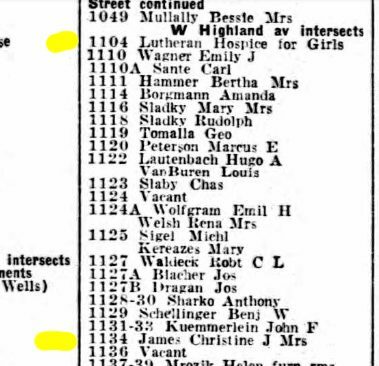 The property at 1134 N. 12th Street was registered to his nurse, Christine James, in 1932, although it was not her home address during the previous year nor was she living there during the 1930 census. This building may have been chosen for its proximity to the Lutheran Hospice for Girls1. At the time, these hospices served as temporary housing for working-class women and girls, who for some reason or another had nowhere else to go. From the 1932 Milwaukee city directory. 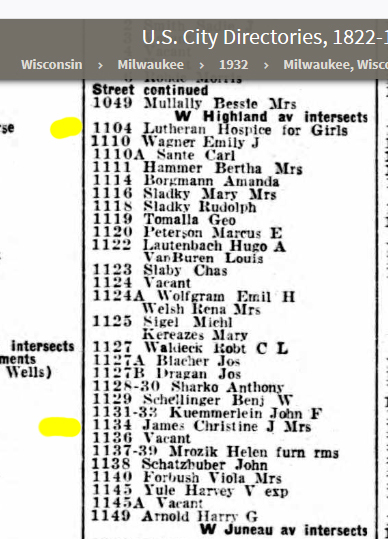 On the 1930 census, 25 single women aged 18-30 were listed as roomers at the Lutheran Hospice2. All were employed, with occupations such as stenographer, bookkeeper, saleslady, and even one doctor’s assistant. 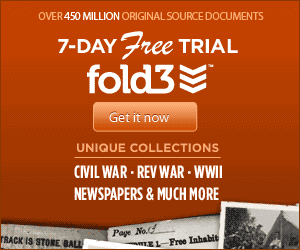 Following the paper trail of these young women showed most did not come from poor households. Several appear in the society pages a few years later, attending charity events, taking vacations, or getting married — not exactly the type of girl one would expect to find living in a shelter. Just a stone’s throw from the Lutheran Home, Dr. Trump’s maternity hospital was attracting plenty of clients. 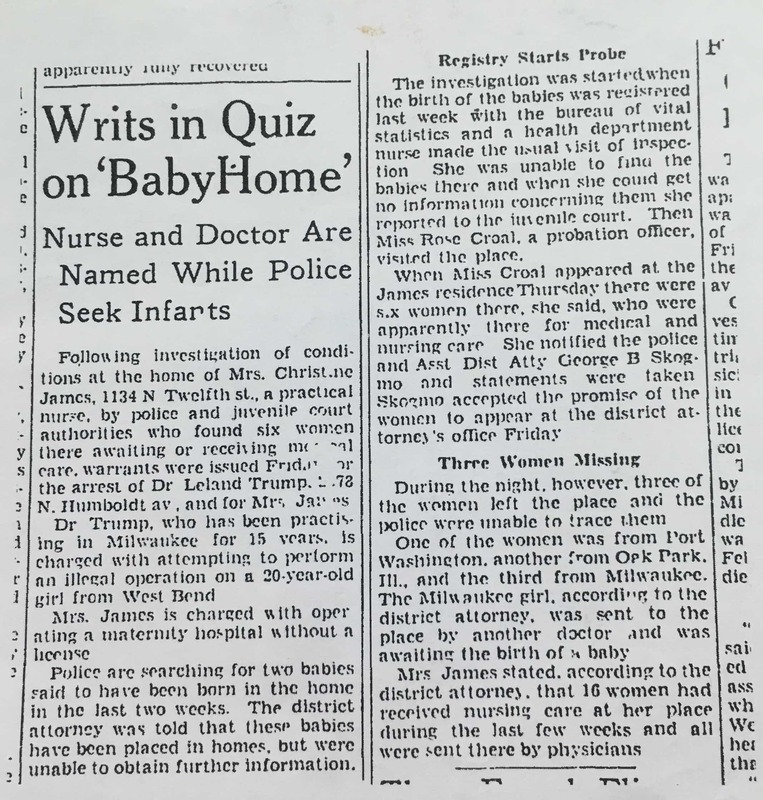 Word must have traveled fast, because according to a United Press article from February 5th, 1932, the maternity home was raided. Leland’s long-running streak of averting the law was over. 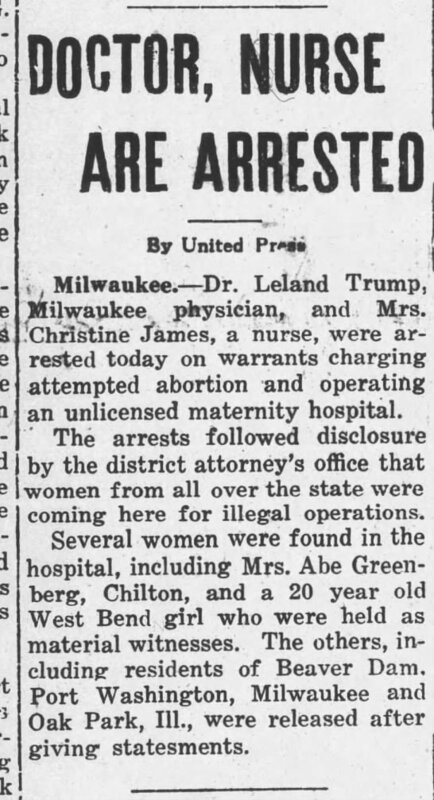 Dr. Leland Trump, Milwaukee physician, and Mrs. Christine James, a nurse, were arrested today on warrants charging attempted abortion and operating an unlicensed maternity hospital. 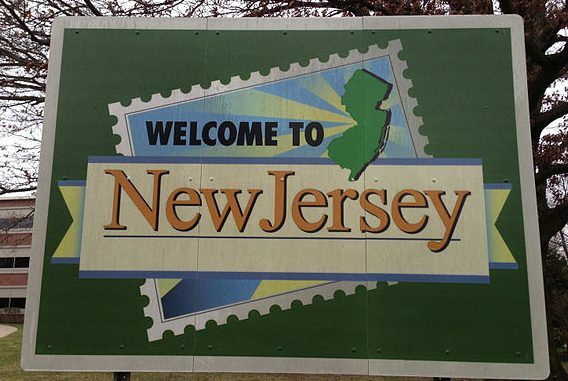 The arrests followed disclosure by the district Attorney’s office that women from all over the state were coming here for illegal operations. Several women were found in the hospital3. The article went on to report that sixteen women had received nursing care at the facility over the past few weeks. 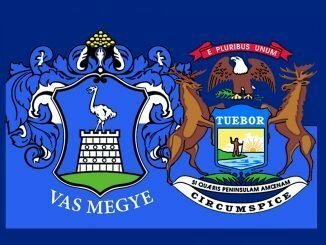 One client was a Milwaukee resident, but others had traveled from Chilton, West Bend, Beaver Dam, and Port Washington. Another was from Oak Park, Illinois. The investigation was started when two babies born at the home were registered with the bureau of vital statistics. This initiated a visit from the health department. 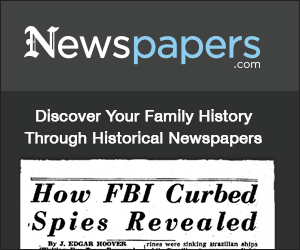 The following day, another article about the raid was published in the Eau Claire Leader-Telegram. 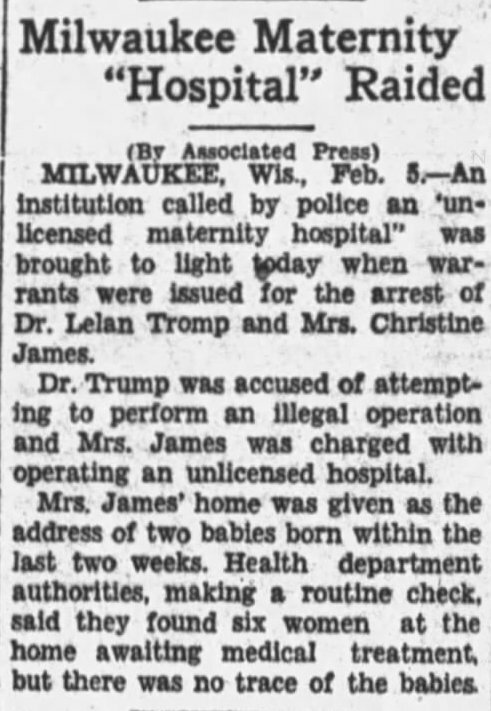 Dr. Trump was accused of attempting to perform an illegal operation and Mrs. James was charged with operating an unlicensed hospital. No reports ever surfaced regarding the whereabouts the babies born at this maternity home. It is not known why those two births were reported, but perhaps it was an error on the part of one of Trump’s associates. 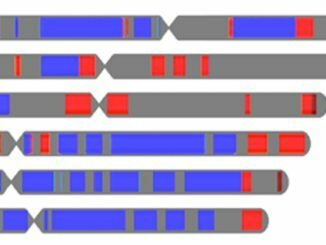 Four years later, when Lawrence was born, his birth was not reported. He received a delayed birth affidavit, signed by his pastor and school principal, when he was ten years old. 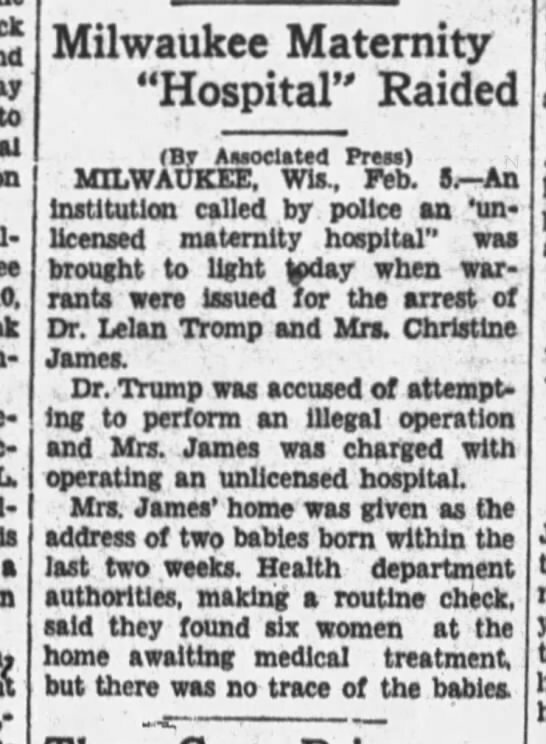 During the trial, the West Bend girl stated that Dr. Trump had twice performed an abortion on her, charging $100 each time. Nurse Christine James turned state’s evidence against Trump in exchange for a lenient sentence. With the testimony of these women, Leland Lewis Trump was fined $250, convicted of manslaughter, and lost his medical license for one year. 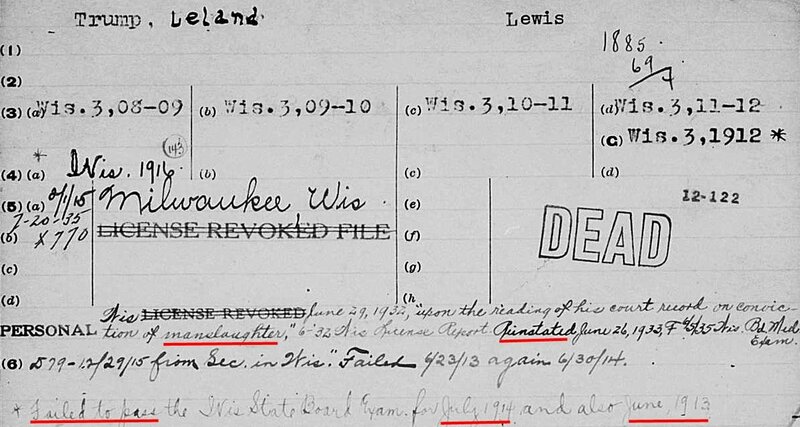 From the AMA’s Deceased Physician Files Index for Leland Trump: License revoked June 29th, 1932, upon the reading of the court record on conviction of manslaughter … Reinstated June 26, 1933 … failed to pass the Wisconsin State Board Exam July 1914 and June 1913. In this context, the term manslaughter is a bit misleading. To clarify, according to Milwaukee state law, there were varying degrees of severity assigned to abortion in the first half of the 20th century5. 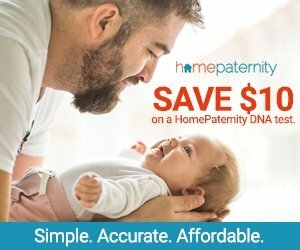 Those found guilty of killing the mother while performing an abortion were given an average of 15 years’ jail time and charged fines ranging from $500-$2000. Abortions performed after the “quickening,” when fetal movement can be felt (anywhere from 14 to 20 weeks), were still considered manslaughter, but the penalty was less severe if the mother lived — though she was then subject to criminal charges as well. 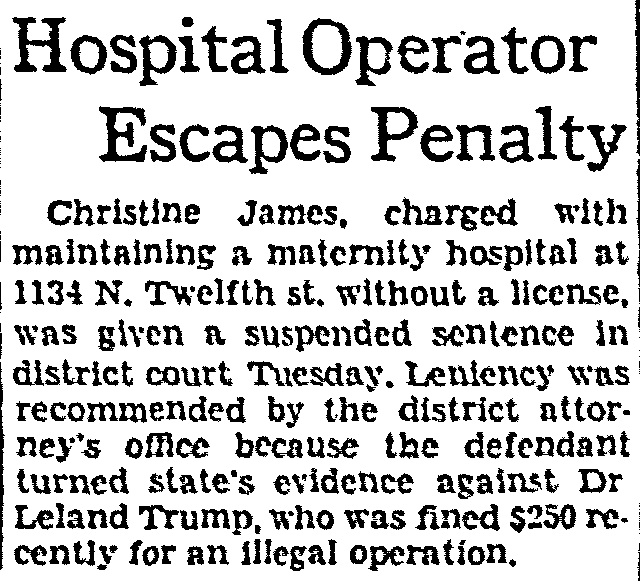 Dr. Trump was likely found guilty of performing the abortions early in his client’s pregnancy, which would explain a 1-year license suspension and no jail time. Even with brother Rodger’s connections, Dr. Trump wouldn’t have been able to avoid the standard penalty for such a widely publicized conviction. However, the punishment apparently wasn’t severe enough to convince Leland to change his ways. A few years later, a 20-year-old girl ended up in Dr. Trump’s office. Four years prior, she started working at a bakery. Around the same time, a man living just outside of town began working at the same bakery. Although there was a 10-year age difference between him and the girl, they became intimately involved. The girl became pregnant in the spring of 1936. By the end of the year, the man was no longer working at the bakery. In December 1936, Lawrence was born of their union. 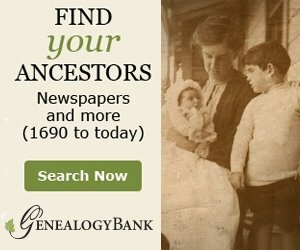 Did Henry and Clara know Lawrence’s parents? Recalling what Lawrence had been told about his parents (father was a baker, mother was a teacher), they may not have been complete strangers. Lawrence’s mother did become a Sunday school teacher several years later. However, “baker” was a very common occupation, so it could be purely coincidental. 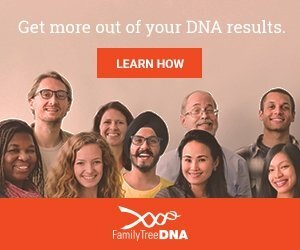 Was Leland related to them in some way? 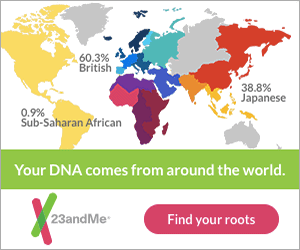 While researching Dr. Trump’s family — to be absolutely sure he wasn’t related to the President — I was unable to find a link between Trump’s Austrian mother and Lawrence’s Austrian-Hungarian father. Probably, Lawrence just happened to be the first displaced child Leland encountered after the death of his good friends’ daughter. 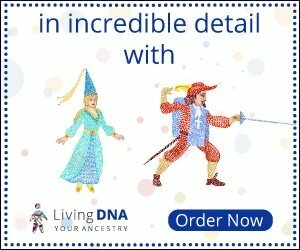 Possibly, Leland knew the biological parents and felt they resembled Henry and Clara enough for Lawrence to pass as a their natural-born son. We don’t know how many babies Leland delivered or how many abortions he performed, but in 1938, a government employee named Walter Drews tried his best to find out. Drews, an 18-year veteran of the Wisconsin State Board of Health, conducted an investigation of Dr. Trump’s Humboldt office.